Do you seek a "three-handed sword" for your proud Andergastan knight? How about a longbow for your Nostrian huntswoman from the Forest Wilderness? 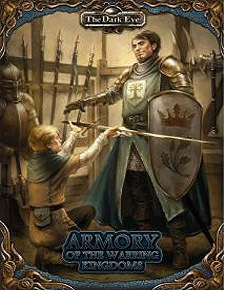 The Armory of the Warring Kingdoms includes stats, rules, and artwork for all the weapons, armour, equipment, and unique artefacts of Nostria and Andergast - the Warring Kingdoms.